Social Committee Event: celebrate the release of Antoinette Chambeyron’s book at La Page bookstore on June 9th between 2.30pm and 5.30pm. “Plus qu’une vie. 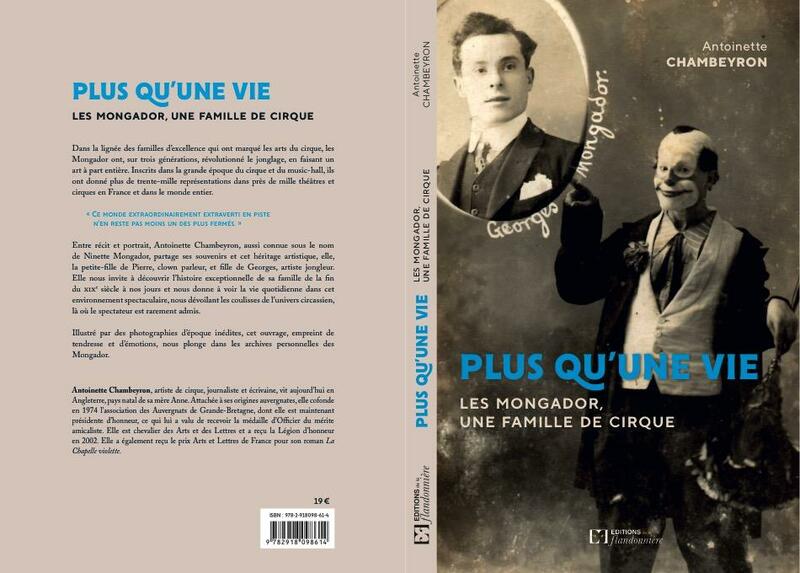 Les Mongador, une famille de cirque” retraces the memories and artistic heritage of Antoinette Chambeyron, also known as Ninette Mongador, from the 19th century to the present. Over three generation, her family has made history in the circus arts and revolutionised the art of juggling. Antoinette Chambeyron lives in England, is one of the founding members and Honorary President of the Auvergnats of Great-Britain Association, was appointed Chevalier des Arts et des Lettres and Chevalière de l’Ordre de la Légion d’Honneur. Antoinette is one of the persons the Social Committee regularly visits and supports. To toast to the success of the book at La Page bookstore in South Kensington, please register with info@auvergnats.co.uk.